More innovation on its way? 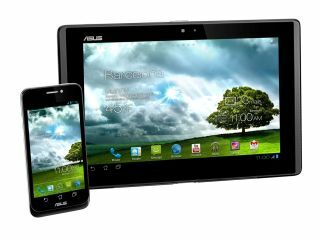 Asus is looking to get fully into the smartphone market and it will use its new Padfone phone-come-tablet-come-netbook device to kick start the campaign. Speaking to TechRadar at MWC 2012, Asus Corporate vice president Benson Lin confirmed that Asus is looking to expand its mobile phone offering, but is aware that the company is by no means well-known in the smartphone market. Lin went on to say that Asus "is doing something different to try and win in the market". The Padfone builds on Asus' tablet pedigree and Lin hopes that success will see consumer confidence transfer over to its smartphone division. The Padfone combination can be sold separately, allowing consumers to get a taste for an Asus smartphone without having to shell out for the full package of tablet, keyboard dock and stylus. The Padfone will hit UK shores in April and is likely to come with 16GB of internal storage, however Jonathan Santaub, Asus Regional Director for UK and Ireland confirmed that 32GB and 64GB flavours will also be available in certain markets. Santaub went on to say that the LTE enabled Padfone set to launch in early Q3 could make its way to Britain this year if the mobile networks launch their LTE networks.